2018 Specialized Enduro 650b Stealth Shred Sled. Presenting our 2018 Specialized Enduro shred sled. While piecing together this build, the focus was on durability, reliability, speed, and fun. This bike is always ready to go (with save-a-ride supplies conveniently stowed in the frame’s SWAT pocket), all that’s needed is to fill a water bottle and head for the trails! The two most amazing characteristics of this setup are ground-hugging feel and absolute silence. Zero noises, save tire knobs trying to tear off and wind in your ears is actually noticeable when absent. The most challenging part of writing it up was keeping the bike clean for more than a day! 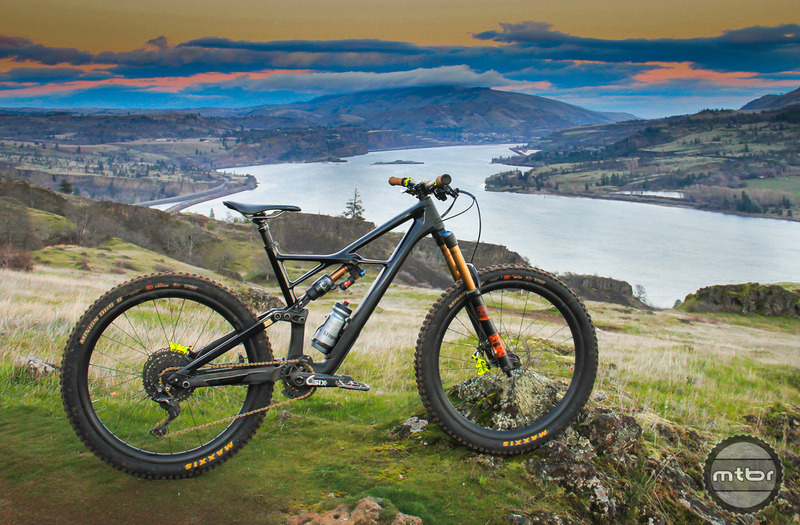 For reference, a stock Enduro S-Works 29er costs $8500 with photos and description here. Many people have asked why I started from a frame instead of purchasing a complete setup. After all, who buys a car chassis and then adds an engine, transmission, etc? A frame-level build is definitely more expensive, yet there is a tipping point where it makes sense. In this case, it was knowing I wanted different wheels, suspension, brakes, and dropper. With most builds, riders will replace the bars, stem, and saddle for proper fit, but beyond those items, parts get expensive rather quickly. At the time I acquired this frame, Specialized did not offer the Bike Configurator, allowing selection of custom colors, damping solutions, etc. Now that they do, it would be a harder decision. Reasoning: I’ll start with my top three. First, I like the geometry, especially with the latest round of updates, adding some reach and ramp-up. Secondly, the SWAT pocket. It’s so nice to stash all the save-a-ride parts, a tube, and even a tire pump in there. Third, I’ve had excellent customer support from Specialized and my LBS also has a close relationship with them. That’s a critical aspect of selecting a bike: who does your local bike shop support and do they treat you well? This is the second Enduro I’ve owned, the first was a 2013 29er and the LBS always received manufacturer support and got me back on the trail within days. A few people have asked who this mystery bike shop is. It is Scotts Valley Cycle Sport and Andrew and Brittany Cavaletto will treat you right and live to ride. Some other selling points for this bike are the threaded bottom bracket, clean and efficient cable routing, aesthetically pleasing design. Did I mention a threaded bottom bracket? When riding the bike, it feels like it’s on rails, smooths out the trail and runs completely silent. 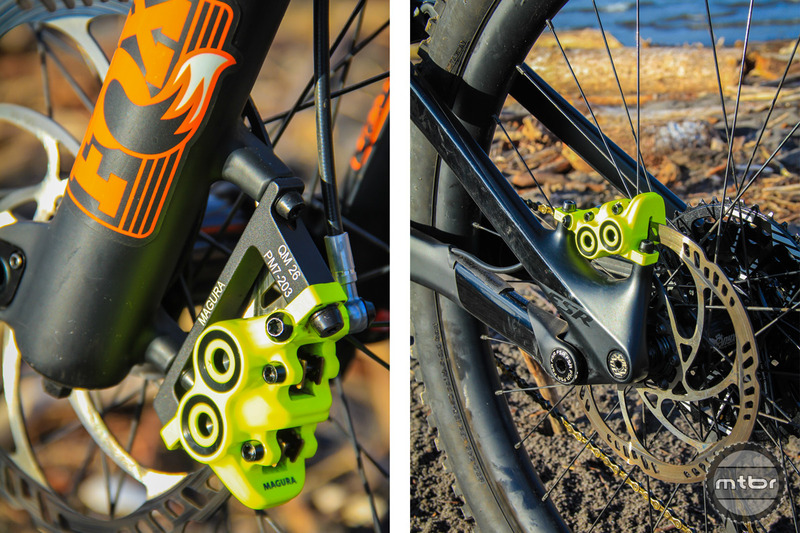 Magura MT7 Danny MacAskill stoppers provide great power and modulation, plus a splash of color. Reasoning: Huge stopping power while allowing modulation. These brakes also include Magura’s HC3 levers which allow adjustments of both lever reach and leverage, which lets you maximize usable range of the lever based on traction available (wet/loose vs. dry). My previous setups have all ended up with Shimano Saint stoppers, these MT7’s offer similar power with better modulation. Magura HC3 levers offer a ton of adjustability. 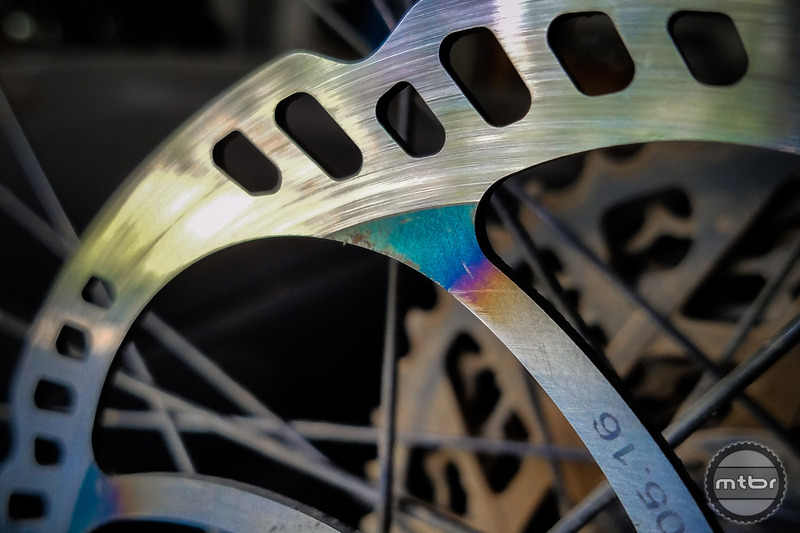 Magura Storm SL Rotors 203mm/180mm f/r featuring “rotors can be hot” colorway. Any impressions on how the Enduro rides with the Fox suspension, possibly in contrast to the Ohlins setup the factory builds come with? Hi Sean – this originally had the Ohlins rear, which I rode for a while – but I’ve not ridden it with their fork. My issues were blowing through all of the travel with the STX22, wanting a bit more ramp-up, even at max air pressure. It was a choice of small bump versus not bottoming out vs. The X2 offers increased tunability, so covers a wider range of riding styles and rider weights, plus lets you increase the spring rate for deep travel via the volume reducers. My stock stx22 cavitated (air in the damper) within about 10 hours, which they did cover under warranty, but I swapped it out at that point. Also, I definitely like having the climb switch on this bike. I’ve heard of a few people having Ohlins tweak their stx22’s at the factory to get some more ramp-up (basically, reduce the air volume a bit to increase the spring rate for deeper travel). Unsure about any revalving possibilities though. Cheers! Thanks for the response JB. That’s actually almost exactly what I was worried by with the STX22. I have an X2 on my current bike and love it, especially with how tune-able it is, especially being over 200 lbs my self. Looks like I know what to stick with. Much appreciated. Haha – true, yet it is heavy relative to many designers and pro riders, the ones creating the tunes and doing the development & testing. Awesome build! I would only consider changing the dropper to a Bikeyoke Revive at 185mm drop. But only for reliability. The Revive I’m running now has been flawless, and any air that mixes with oil gets fixed by doing a Reset, which takes about 5 seconds.. I did not know that you could change the KS dropper’s cartridge. Thanks Tony. I’ve not tried the Revive myself but know others that have and they all recommend them. My only concern is I store the bike vertically to keep the wipers lubricated, so the dropper would be inverted and read that could require frequent bleeds. That said, I cannot speak from personal experience. Online prices are between 70 and 90. Nice build and write up JB! I was thinking a lot of the same things you were thinking during my HTLT PUSH custom build up. Grip, reliability, stopping power due to 205 to 210lbs without gear, and fun factor! And then on the bars…I’ve never tried 35mm bars…still on 31.8 enve dhr’s. What’s the hype on the 35mm? I debated long and hard on tires but just couldn’t pull the trigger on the maxxis…ended up with e13’s new single-ply setup and the DH LG-1 for a spare. At 210lbs did you consider a coil setup front and rear, or was the added weight not worth it to you? P.S. great choice of BB and wheels too! Curious as to why you run a 170mm crankset. Is it only to prevent rockstrikes? We are similar heights, and even my 175s feel a bit short sometimes ( think circus clown on mini trike). Infact, Ive been tempted to try some 180s just so I can put down some more power down on those pedally enduro segments. BTW, great seeing your contributions on MTBR! 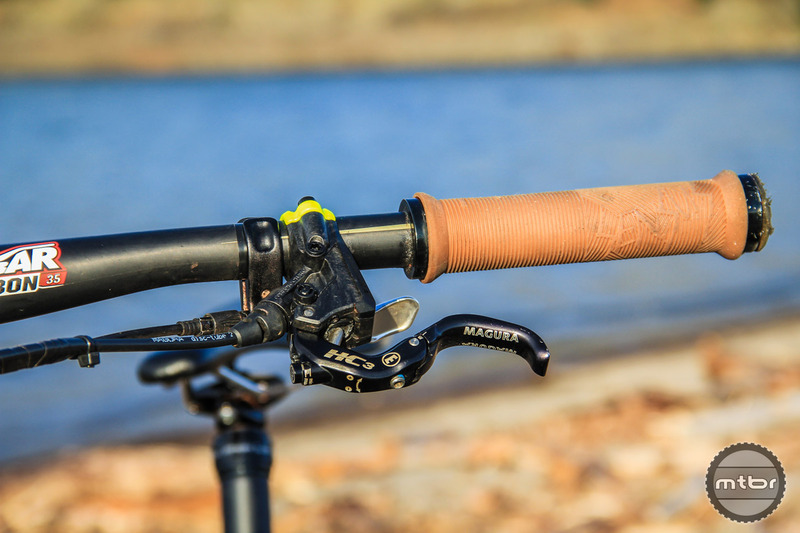 Are you able to slam your seat post all the way into the seat tube or is your post too long? I ride a 2017 Large Sworks Enduro and would love to run a longer post.